Knickernappies Holiday Gift Guide 6 of 10, Green Gifts & Giveaways Galore! Only 5 more days until Christmas and this is day SIX of our Holiday Gift Guide w/ daily giveaways! So far we've chosen TEN lucky winners and there are plenty more opportunities to come. Thanks so much for following along with our Gift Guide and participating in our giveaways! We're super excited to make this the most prosperous holiday season of all for our great retailers. Check out today's sponsors below and see what they've got to offer! The Cooking Utensils is designed in a combination of metal and wood. 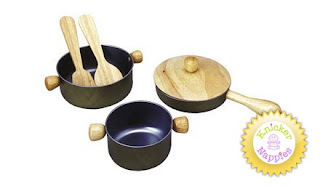 The set includes a frying pan, spatula, a pot with lid, serving spoon and saucepan. It encourages children to role playing various characters with others which. This darling play set will go great with any type of play food whether it be wooden, knit, felt or plastic. This sturdy set will encourage creative play and entertain for hours! Would make a perfect gift any child would be excited to receive. 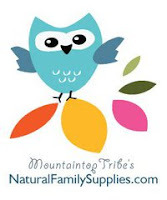 Become a Fan of Natural Family Supplies on FaceBook by clicking HERE. My Little Seat from Soft and Cozy Baby! My Little Seat is a must have for any family or family-to-be! Take it with you wherever you go and you'll never be without a safe place for baby to play or eat. Don't like dragging a booster wherever you go? Have only one highchair in the house but sometimes need more? Does your baby prefer to sit in a chair at the table with you? Mylittleseat is the Ultimate Travel Highchair! It features a 5 point harness system and fits all chair shapes; it even has holes to accomodate chair poles! Mylittleseat has 4 ties and 2 harness straps to help secure even the more energetic tots! A toy ring loop is attached and it folds up compact into its own matching carry bag. Perfect for babies who can sit up unassisted and for older toddlers who need a bit more security when sitting in a chair. Want to stay updated with all the latest and greatest from Soft and Cozy Baby? Become a Fan on FaceBook today! Leslie's Custom Diaper Totes from Baby Hopes Cloth Diapers! Leslies Diaper Totes from Baby Hopes Cloth Diapers would make the ultimate gift for any mom whether they use cloth diapers or not! Available in a variety of prints, a must have diapering accessory...or should I say luxury! Snap pocket on the front. Zippered pocket on the back. Left side snap pocket perfect for keys, cell phone, PDA, etc. Right side elastic pocket perfect for bottles, magazines, etc. Currently available in a dozen different fabrics...and more to come! BabyHopes is having a HUGE end of the year Clearance right now so be sure you Fan her on FaceBook and find out first what's on sale and all the details! *Each day of the Holiday Gift Guide we'll have a 24 hour Giveaway. You have until 12pm (Noon) EST the following day to enter. Today's Prizes: Two winners will be chosen. (1) Winner will receive a $20.00 Gift Certificate to Soft and Cozy Baby and (1) Winner will receive a $25.00 Gift Certificate to Natural Family Supplies! How to enter: **For each method of entry that you complete you must leave a comment on this blog post. Please make sure you leave your email with each comment or make sure we have a way of contacting you through FaceBook or Blogger, etc. Each winner will have 48 hours to claim their prize before an alternate winner will be chosen. (1 entry) Follow Natural Family Supplies on FaceBook and comment on their wall to say hello and verify that you indeed became or already are a Fan. (1 entry)Follow Soft and Cozy Baby on FaceBook and comment on their wall to say hello and verify that you indeed became or already are a Fan. (1 entry)Visit Soft and Cozy Baby and comment here with one other item you'd like to purchase from them besides the featured Gift Guide item. (1 entry)Visit Natural Family Supplies and comment here with one other item you'd like to purchase from them besides the featured Gift Guide item. (1 entry)Become a Fan of Knickernappies on FaceBook. (1 entry)Follow the Knickernappies Blog. (3 entries)Share today's giveaway on FaceBook, tag "Knickernappies" and link to this giveaway in the post, or tweet about the giveaway and include @knickernappies and a link to this giveaway in the tweet. *Reminder, you have until 12pm EST on Dec 20th to enter this giveaway and then 48 hours to claim your prize if you do win. Check back daily because we'll be having giveaways on our Gift Guide every day until December 24th! Good Luck! 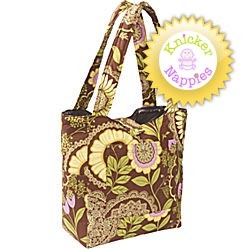 I am a fan ofknickernappies on fb! I would love to buy a dozen of the infant size prefolds from natural family supplies! visited Natural family supplies and I love the magic pet wands. visited warm and cozy baby and i love the Mini Moby!!! BIG fan of Knickernappies on FB!! I'm already a fan of Natural Family Supplies on fb! I liked Soft and Cozy Baby on fb! I'd buy the maple wooden teether from Soft & Cozy Baby because I don't like plastic teethers! I'd buy the ss 2-tier tiffin from NFS because that's just awesome! I'm already a fan of KN on fb!!! I am a fan of knickernappies on fb. I would love some Rumparooz or Mama Cloth from Soft and Cozy Baby. I would love to get the wooden vegetable set for my kids to play with at Natural family supplies. shared this giveaway on my fb page and tagged Knickernappies. I am a fan of Natural Family Supplies on FaceBook and commented on their wall. I am a fan of Soft and Cozy Baby on FaceBook and commented on their wall. I am following the Knickernappies Blog. I shared today's giveaway on FaceBook, tagged "Knickernappies" and link to this giveaway in the post. i LOVE the tummy tub and stool set. i am going to buy it after the holidays for my little one. how adorable! i LOVE the Mercurius Blackboard Pastel Chalk! my girls have been showing a LOT of interest in art (must be the genes! i'm an artist!) and so i want to expand their mediums and show them more techniques ;) this would be perfect! I follow the Knickernappies Blog! I like the Walk N Roll at Soft and Cozy Baby. I like the Silks Reversible Cape at Natural Family Supplies. I'm a fan of Knickernappies on facebook. I follow the Knickernappies blog. I was already a fan of Natural Family Supplies! I "liked" Soft and Cozy Baby on FB! I would like to try Static Eliminator Dryer Sheets from Soft and Cozy Baby! I would like to try Knickernappies Stackable Hemp Mama Pads from Natural Family Supplies! I'm already a fan of Knickernappies on FB! I follow the Knickernappie Blog on GFC! I am a fan of Natural Family Supplies and I commented on their wall! I would like to have the Solid Drum. I am a fan of Soft and Cozy baby! I would like the tie up shoe from Natural family supplies. I follow NFS on FB! I follow S&CB on FB! I'd like to try the mama cloth from S&CB! I like KN on FB! I follow the blog via GFC! Liked Natural Family supplies on FB. Liked soft and cozy baby on FB and wrote on their wall. I like the Catbirdbaby winter cover from soft and cozy baby! I like the zolowear baby sling from Natural Family Supplies. Your Guide to Cloth Diapering at Daycare! Tips on 'Going Greener' for the New Year! Today's Featured Fluff Addict is...Gina!